Beginnings of Time to 1562 A.D. - We the people of Timucua lived in harmony with nature building a strong nation that lived in harmony with our land. We used the natural resources of our country to provide for the basic needs of our people. We thanked the Great Creator each spring for the new life of our lands and for our crops. We then preserved the bounty of our harvests in the fall to prepare for the coming winter's cold. We shared a beneficial trade system with the Creek and Cherokee tribes to our north, the Calusa, Miami, and Seminole tribes to our south, and with the Appalachee and Choctaw tribes to our west as well as with other nations beyond our shores. This provided a good life for our people as each summer brought trade fairs from all parts of the Western Hemisphere and the winter brought time to work on our construction of canoes and homes. This was the cycle of life that was enjoyed in a simple harmonious manner with the land from the beginnings of time until 1562 A.D.
1562 – 1565 A.D. In 1562 A.D., the European Conquest of our lands began. At first it seemed as though it would be another people coming in and peaceably co-existing with our nation looking for trade in the summer and to join us in hunting and fishing in the spring and fall. The French came under the leadership of their Admiral Jean Ribault. This group was quite beneficial to our people with teaching us new technologies we had no idea of before. However this was the quiet before the great storm. 1565-1665 A.D. In 1565 A.D., the Spaniards arrived in our lands to carry out their blood vendetta with the French and force them from the Florida Peninsula. Under the leadership of their Admiral Don Pedro Menendez de Aviles, they drove the French from our lands and set up the military fortress that would become San Agustin de la Florida (modern day Saint Augustine). From our villages around our lands and the capital of Ossachite, we took a policy of neutrality in this matter waiting to see what would happen. What happened was a 100 year period of uneasy and tense co-existence with the Spaniards. Our warriors tried to push them out of our lands as they came not to trade, as the French had, but to exploit our lands for their own purposes. Unfortunately this led to much bloodshed on both sides. The Spaniards proved to be more powerful than our warriors and eventually they established themselves as the dominant force along our coasts. Our people retreated to the interiors of our lands and lived as we always had waiting for the day to reassert our independence. 1665-1763 A.D. Beginning in 1665A.D., the Spaniards took a different approach to our people and introduced the Gospel of Christianity to our lands. They sent out Catholic missionaries preaching the Gospel to our people more and more. Our people readily accepted this new teaching and combined Christianity into our own traditional culture. Today over 95% of our people are practicing and avowed Christians. It was during this period, that in addition to the Gift of the Christ that the Spaniards gave us, they also taught us to read and write in our own language. They also preserved our language for us and created a dictionary and grammar book of our language under the leadership of their Father Pareja. This was to prove to be a great gift with the challenges that would come in the coming years. 1763-1783 A.D. This time marked a new storm with the arrival of the British in our lands. The peaceful co-existence that had taken 100 years to build with the Spaniard was shattered with their arrival and for the next 100 years their would be war in our lands. The British came in and not listening to the Spaniards chose to use our lands for their own enrichment. Our people rebelled as before only to be again unsuccessful in our use of force. 1783-1821 A.D. This period saw the return of the Spaniard and some return of peace but it was periodically broken in short periods of war as the Americans pushed the Creeks from the north into our lands and came in themselves to our lands seeking their own riches from our bounty. We would try yet again in the future to use force for our independence as we would ally with the Creeks and Seminoles against the Americans as they began their encroachments in our lands. 1821-1858 A.D. This period saw the Americans taking over our lands as the dominant people from the Spaniards and we would see a long period of war and suffering as the Americans learned the hard way the lesson we had had to teach others in our lands. The age old lesson of living in co-existance with our land rather than trying to abuse it for their own wealth. This period is known by official historians as the First, Second, and Third Seminole Wars. These would prove to be the most expensive wars against native peoples in the history of the United States. With our Creek and Seminole allies, our warriors one last time marched to war against the encroachments of the European colonizers and their descendants. This would be the last time that we tried by force to regain our independence. 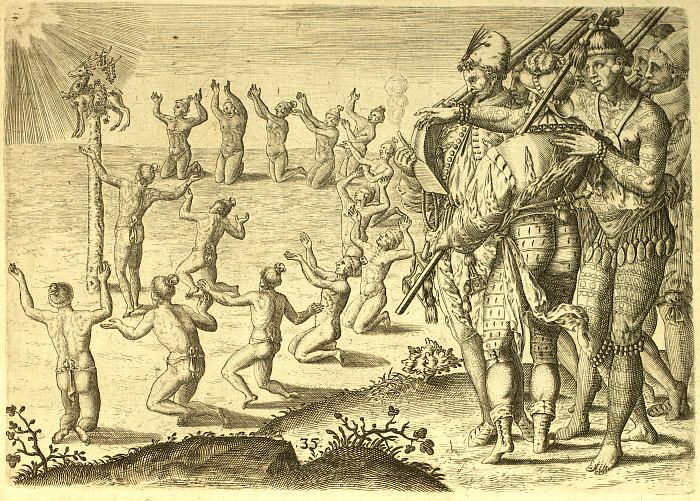 This time brought much pain and suffering to our people as many were forced south into the swamps of the Everglades with the Seminoles or were sent west to the plains of Oklahoma with the Seminoles who were forcibly removed from the Florida Peninsula. It was during this time that the last speakers of our language were lost as those of our people who remained assimilated into the dominant European/American culture and began to live closer with the Americans and more among them to guarantee our own survival. 1858-2008 A.D. This period of time saw our people living among the Americans, assimilated into their society for our own survival. We participated in their own Civil War and other wars and served with them admirably. We learned of some of the good things of the Americans, such as individual rights, right to property, and of liberty, equality, and freedom. However, as before, we continued to see the attitude of the original Europeans among them. That attitude was one of imperialism and greed. Therefore in 2008 A.D., we chose to retake our sovereignty and chose to declare our independence and reinstate our place among the nations of the world. This time we have chosen to refuse the use of force and are living peacefully with the Americans while seeking recognition from them as an independent nation as they have recognized our fellow Native Americans in other tribes such as the Apache, Lakota(Sioux), and Iroquois. 2008 A.D. - Present Day We have today retaken our place among the nations of the world through the Montevideo Convention on Statehood as well as through the United Nations Declaration on the Rights of Indigenous Peoples. We declared our independence unilaterally on 1 August 2008 A.D., and since have begun to rebuild our national government and cultural traditions to preserve our culture for the future. We invite all who share our desire for a peaceful co-existence with all men and with the Earth to join us as overseas citizens. We hope that all who join us will help to bring to the forefront of the global world the necessity to preserve the Earth and that all who join our nation will help to preserve our culture. We are in the process of restoring our language traditions at this time and are working with Father Pareja's documents to start classes to teach our people our language. There will be other cultural projects as the future progresses.